Summary: MARGINAL/SLIGHT risk of severe weather today. The rest of the week is going to be muggy and wet. Today, we are expected to reach 78 degrees with a 70% chance of seeing rain and thunderstorms as we return to work today. Winds will be out of the south southwest at 10 15 mph, with gusts up to 20 mph. The Storm Prediction Center as scaled back a bit on the SLIGHT category for severe weather from the previous outlooks we’ve shared with you the last couple of days. 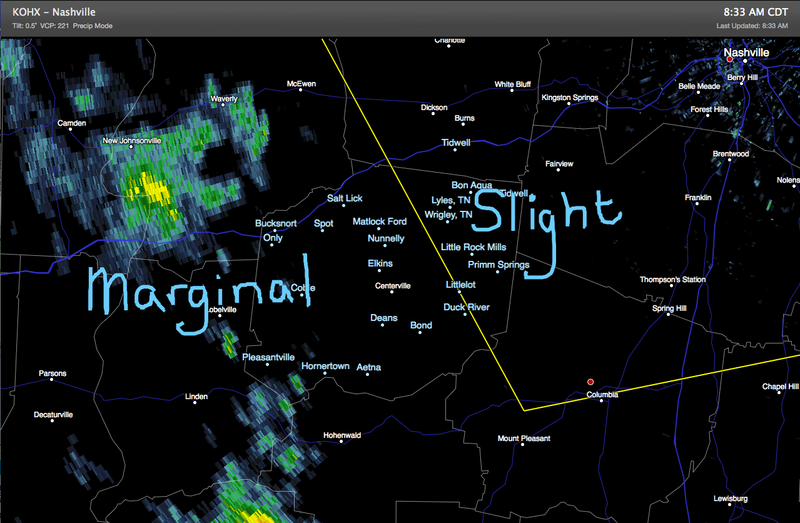 Today’s outlook splits the county between MARGINAL and SLIGHT. For a bit clearer picture, below is the dividing line of where Hickman County falls (inside the yellow line area is SLIGHT, while outside is MARGINAL). And a 2% chance of seeing a tornado within 25 miles of a point. What this means is that we have enough instability in place for storm development, a few of which may become strong to severe. There is also enough low-level wind shear in place that we cannot completely rule out a tornado. Keep in mind that most of the cells that develop today will not be severe. Any severe storms that to develop will be isolated. 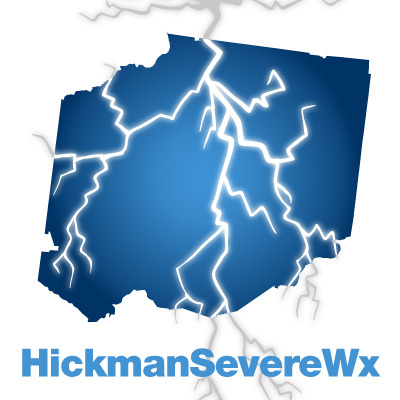 Widespread severe weather is not anticipated. Based on the latest HRRR model, the peak time for active weather today appears to be late morning through mid afternoon. Main modes of severe weather appear to be mainly damaging straight line winds and an isolated tornado or two. 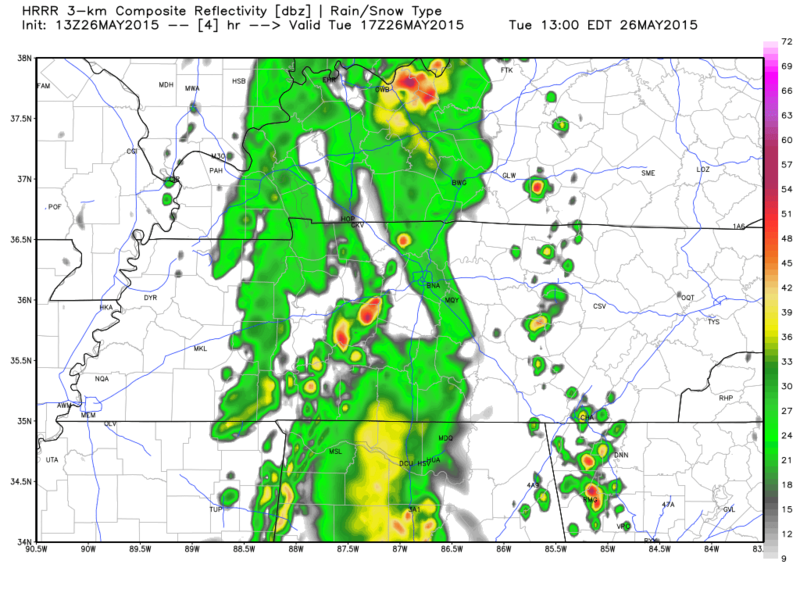 The latest HRRR model is indicating a chance for strong storms around noon today. Keep in mind the placement of these storms is not exact, but a guess. This model image shows a line of storms trying to develop right over top of us. 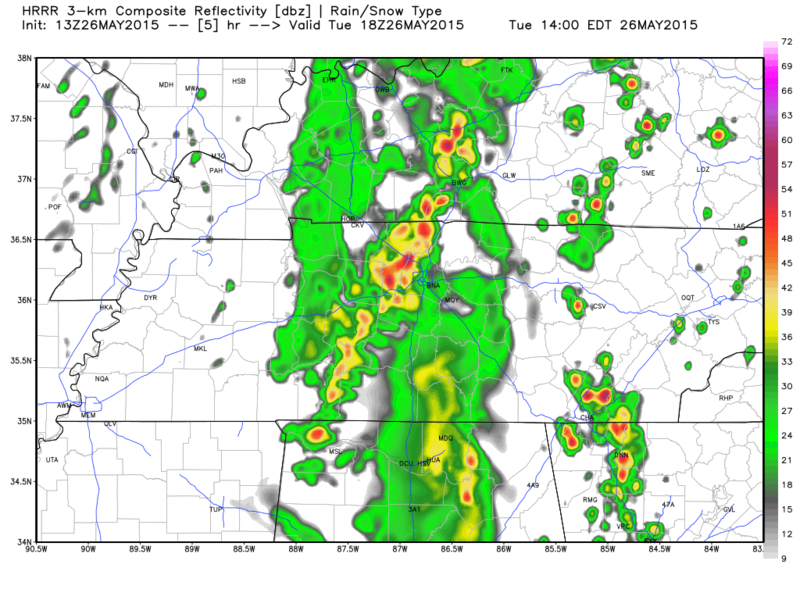 You can see the line better in this next HRRR model for 1pm. Any storms that develop and become severe will likely be isolated, thus this isn’t expected to be a widespread severe event. 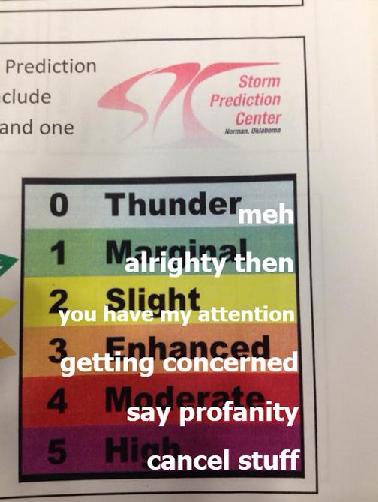 This isn’t a panic day, but a day to stay alert to the radar. We will be watching this as the day unfolds, as we are already seeing some rain out there. Tonight, rain chances drop to 30% with an overnight low temperature of 65 degrees. The rest of your short work week will be wet. Unfortunately, we won’t see the end of the wet weather after today’s severe weather chances. Wednesday we will keep rain and storm chances with a 40% chance of rain and a high temperature of 83 degrees. No severe weather is expected. 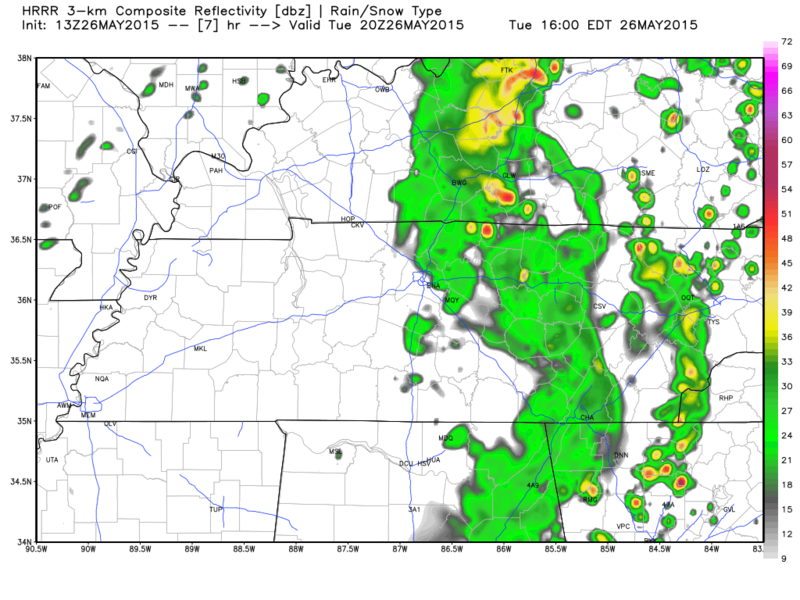 Wednesday night rain chances stick around at 30% with an overnight low of 65 degrees. Thursday and Friday both also see a 40% chance of rain with high temperatures of about 85 degrees. Overnight lows will be about 66 degrees with 20% chance of rain both nights. The weekend is likely to start wet with a 50% chance of rain Saturday and a high of 84 degrees.